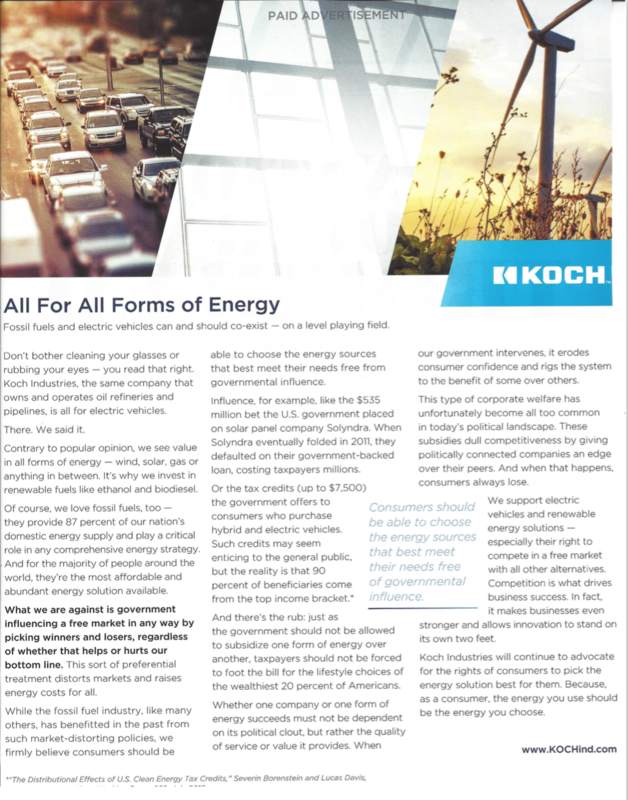 “Fossil fuels and electric cars can and should coexist—on a level playing field.” That’s the tag line underneath an advertorial purchased and produced by Koch Industries in the April 25, 2016 issue of The Hill. Let’s go ahead and unpack this oil- and gas-funded attack ad that’s so cleverly disguised as a level-headed, populist argument. This is a classic persuasive writing tactic of telling the reader what they want to hear in an attempt to own the “middle ground” of a debate. Pay attention to the turn there. They see value in wind and solar, but only invest in ethanol and biodiesel, both of which require the very types of refineries that Koch specializes in. The former point is the problem. If the world stands a chance at achieving the climate goals the world leaders agreed upon in Paris in December of 2015, and if the U.S. hopes to limit emissions to the levels we promised to ourselves and the international community, then the U.S. simply cannot continue using energy is derived predominantly from fossil fuels. The latter point is mere opinion (and a cynical opinion that dooms the world’s population to the worst fates of climate change). Easy to say after decades of subsidies have developed the energy infrastructure, delivery systems, and markets that essentially make up the entirety of Koch’s bottom line. That’s according to a 2015 report by Oil Change International and the Overseas Development Institute, which used the International Monetary Fund’s definition of “subsidy,” and limited the calculations to only those in the upstream sectors—the exploration and extraction of the resources. Here’s another, perhaps even more damning perspective. 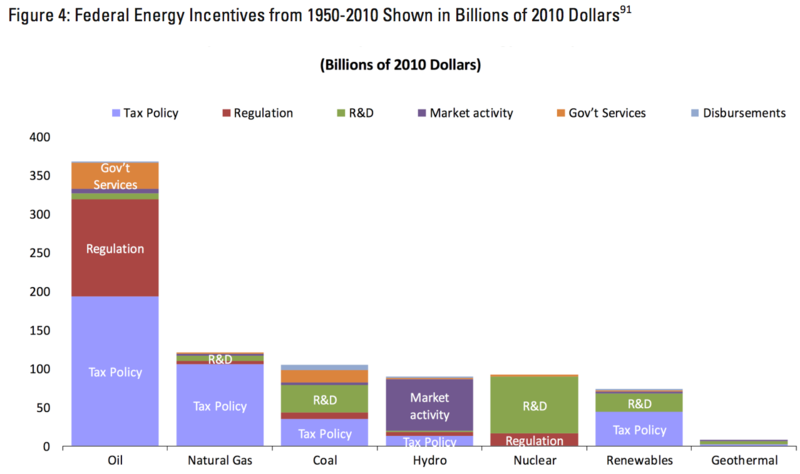 Historically, fossil fuels have been the largest beneficiaries of federal energy incentives. The federal government spent $837 billion dollars (as measured in 2010 dollars) to subsidize energy between 1950 and 2010. Of that sum, fossil fuels claimed 70 percent, or 594 billion dollars. Bottom line: Oil and gas are made artificially cheap for American consumers by the government’s intervention in the free market. The Koch brothers have continuously lobbied to preserve oil and gas subsidies. In a detailed 2011 report on Koch Industries, the Center for Public Integrity wrote: “Oil is the core of the Koch business empire, and the company’s lobbyists and officials have successfully fought to preserve the industry’s tax breaks and credits.” The report documented that Koch lobbyists have worked to preserve billions of dollars in oil industry subsidies, including the Section 199 manufacturing tax deduction and the “last-in, first out” accounting rule. And in fact, according to the International Business Times, Koch Industries has itself directly secured subsidies totaling more than $195 million. And that’s just the obvious ones that were found by publicly-available information! So let’s see which subsidies Koch doesn’t like. Public financing and loan guarantees are, to be sure, subsidies. But it’s not just solar companies that secure these. In 2010, for instance, the U.S. Department of Agriculture’s Rural Utilities Service provided $77 million in loan guarantees and loans to the natural gas and petroleum liquids industries. But that’s just one small program. In 2013, the Department of Energy announced $8 billion in loan guarantees for “advanced fossil fuel projects.” Still waiting to hear Koch Industries reps criticize this solicitation. Pay attention to this point, as it’s one that the Koch brothers and their allies are going to continue to hammer. And, yes, it’s true that there’s a tax credit of up to $7,500 for the first 200,000 buyers of each model of plug-in electric vehicle (including hybrid electrics and full battery EVs). And, yes, thus far, most of those credits have, in fact, been claimed by buyers of more expensive EV models. But with that tax credit there are currently at least 14 plug-in models that cost under $30,000, which happens to be the average cost of a new car sold in the U.S., so there are plenty of affordable options as well. What’s more, the reductions in greenhouse gas emissions and localized air pollution benefit everyone, not just the drivers. All told, according to the Congressional Budget Office, this consumer-facing tax credit program will cost the government $2 billion over the ten years of the program, which is still less than the oil and gas companies get every year. …”taxpayers should not be forced to foot the bill for the lifestyle choices of the wealthiest 20 percent of Americans. Told you they were going to keep hammering this point. Again, with the tax credit, there are currently more than a dozen models of cars that cost consumers less than your average new automobile, and the environmental, health, and climate benefits are felt by all. The advertorial goes on, continuing to press the point of government intervention dulling competition and limiting consumer choice on the free market. You can read the rest for yourself. But, again, considering how much oil and gas companies —and Koch Industries themselves—receive in government support, the argument sure does ring hollow. If Koch Industries is serious about leveling the playing field and, in their words, “for the rights of consumers to pick the energy solution best for them,” then they should turn their attention away from the relatively small incentives for electric vehicles, and immediately demand an end to the roughly $20.5 billion per year that the government gives out to fossil fuel companies.